In September 2015, a team of scientists announced that they had found a new human species. Their find included 1,550 fossils from at least 15 individuals with a mysterious combination of primitive and modern physical features. 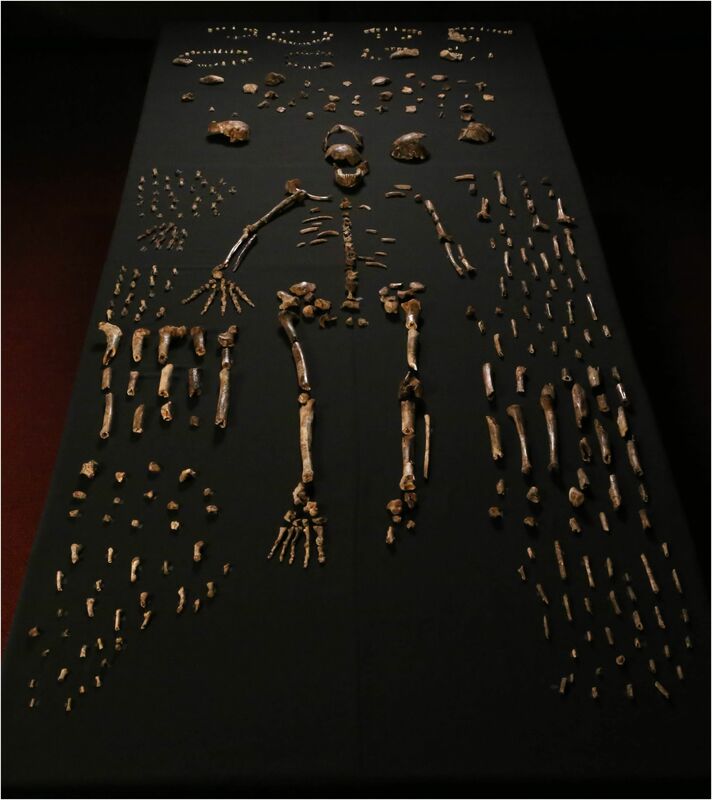 The team, led by Lee Berger of the University of Witwatersrand, named the new species Homo naledi, after the cave system in South Africa where they found the remains. Within a few days, anthropology professor Megan McCullen brought a jawbone from Homo naledi into her introductory archaeology class at Alma College in Alma, Michigan. It wasn’t the original fossil, of course, but a 3-D printed model. Berger and his team have published downloadable 3-D scans of 90 of the fossils on the online database MorphoSource. The 3-D scans provide blueprints for anyone to recreate their own Homo naledi fossils and get their hands on a piece of evolutionary history. A colleague of McCullen’s made a model of one of the jawbone specimens with the college’s 3-D printer. The 3-D printing process deposits extremely thin layers of plastic onto one another to build items according to a template. McCullen took the model, plus several hominin and chimp jawbone casts from the anthropology department’s collection, to her introductory archaeology class. Her students passed around the jawbone and compared its characteristics to the other specimens. The manufacturing process took six hours for the jawbone, McCullen says, but the blue plastic that went into the model (making it look “like a Smurf”) only cost about $5. At that price, even anthropology departments without big budgets can afford to print several Homo naledi fossil models. “It really democratizes our ability to teach students about human evolution,” says Kristina Killgrove, an anthropologist at the University of West Florida in Pensacola. Killgrove printed Homo naledi finger bones, a femur fragment, lower and upper jaw pieces, and a piece of a skull to show off in an upper level anthropology class after the publication. When Killgrove previously bought an equivalent amount of hominin fossil casts, they cost about $1,000. Having access to new Homo naledi models levels the playing field for students at universities that can’t buy many expensive fossil casts, Killgrove says. Without models, students analyze data tables of bone measurements to compare fossils from different species, says Adam Van Arsdale, an anthropologist at Wellesley College. He brought Homo naledi models to his introductory human evolution class and planned to assign his students a research project centered around the 3-D scans. When students examine models themselves, they also get to act more like scientists in the field. In her archaeology class, McCullen used Homo naledi as a case study to teach her students the process of scientific inquiry. The benefits of the published 3-D scans aren’t limited to university professors and students — anyone can download the Homo naledi renderings. This can really enhance the learning experience in middle schools and high schools where teachers might not otherwise have the resources to teach with fossil models, says John Hawks, an anthropologist at the University of Wisconsin-Madison and core scientist on the team that discovered Homo naledi. Of course, amateur anthropologists need access to a 3-D printer to make their own models. 3-D printers can cost thousands of dollars, but people without their own printers can print individual pieces at some UPS stores and other printing centers. Before the Homo naledi publication, if an average person wanted to see early human fossil data, they could only read open access papers and visit museums with fossil casts on display, Van Arsdale says. Now, that’s changed.